to the bottom of the page, The White Rose & The Red, and work up. The first recording attempt by any of TYW, by Anthony Barton, Tim Bayley & James Merryweather. Curate's egg. If you really want a copy I can burn a CD-ROM for you on request. TYW's first ever recording, multi-tracked in a studio (not really the best way to record a live band). Some of the playing is surprisingly good whilst the rest shows how much work we had ahead of us. If you really want a copy I can burn a CD-ROM for you on request. TYW's first proper recording with a proper record company, made over a weekend at Forde Abbey, Dorset. 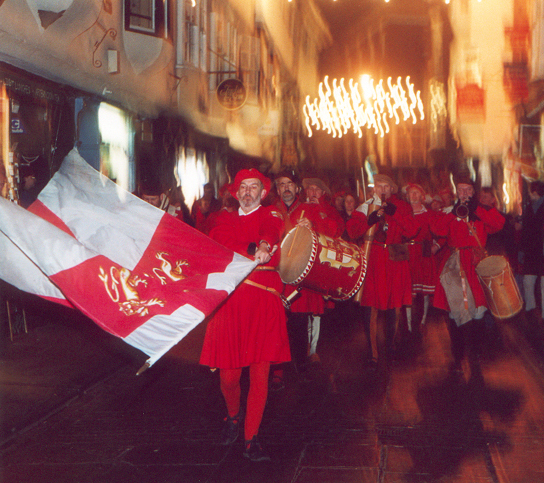 Said by some to be our best, certainly until we made Yule Riding, 2004. Several half decent tracks omitted including Portugaler, which is on White Rose (below). 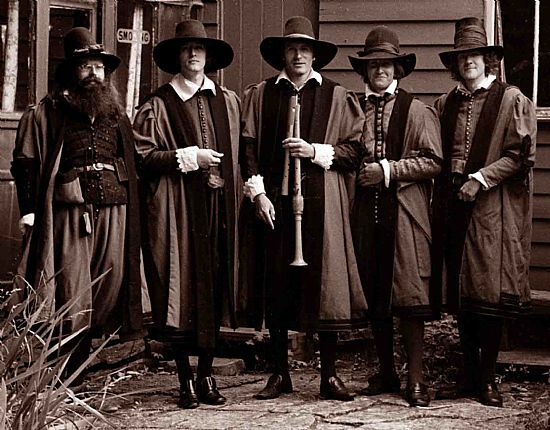 A collaboration with two well-known early musicians, baritone Richard Wistreich (Consort of Musick, Red Byrd) and lutenist Christopher Wilson (Kithara, Fretwork). Two Heritage cassette productions (National Trust etc.) 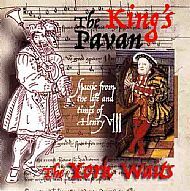 recorded by Derek Sharman of Berwick at St Oswald's Hall, Fulford, York, a church converted into his medieval home by the late Roy Grant, a good friend of TYW. 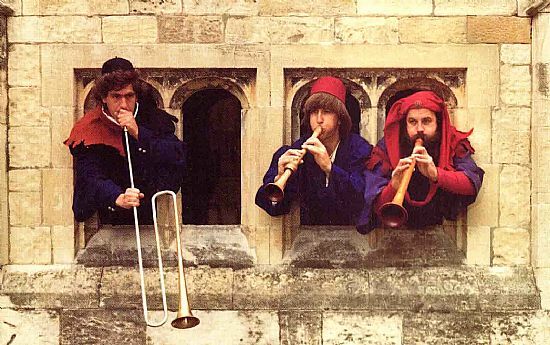 Many grand feasts were held at St Oswald's with TYW or The Medieval Street Band providing music. TYW's Christmas repertoire is large and this was the first of three Christmas CDs. Once again Richard Wistreich joined the Waits as singer, both on recording and at several of their annual Halifax concerts, at the Square Chapel Arts Centre. Another recorded at St Oswald's, this time by Dave Malham (University of York, Music dept.) using Ambisonic surround-sound, which was never put to good use. Production assistant, Mo Merryweather. 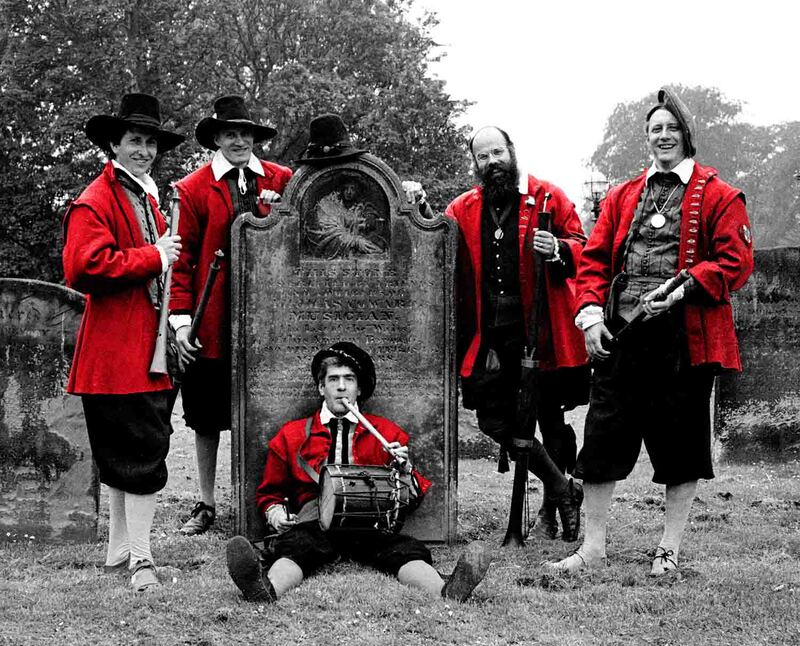 For several years in the 1980s TYW went exclusively 17th-century, with Playford's Dancing Master as their tune source, Tim Bayley as arranger and regular shows with York dancers Punk's Delight (who showed the early dance world how it should be done). 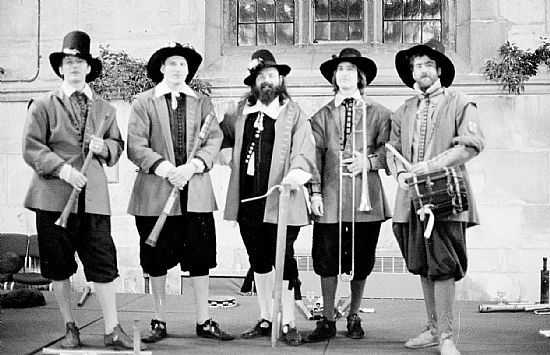 The recording was rather a disappointment, not because of its quality but due to a dispute with the record distributor (Celtic Music) which ended - not well for TYW - at Leeds County Court. Phoenix-like it became Playford Plus, below. Recorded by Dave Malham at Bossall Church near York and then marketed by the late Eric and Ray Cowell of Brewhouse Music. 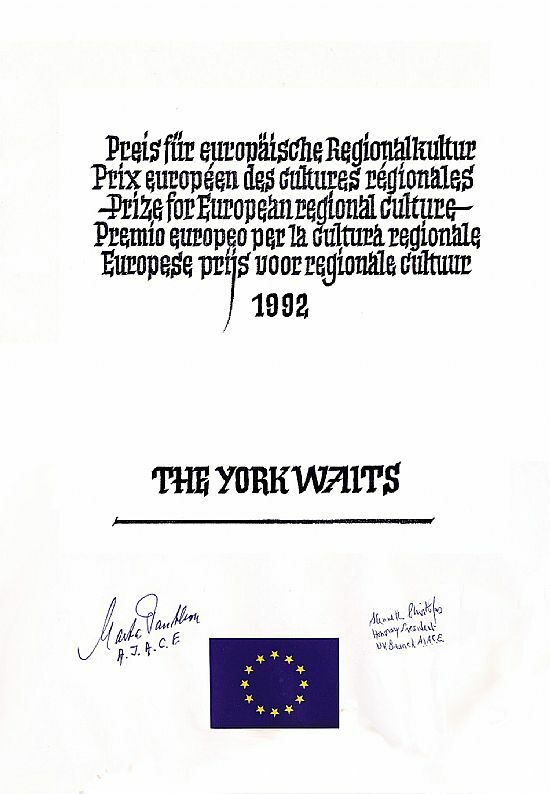 The project was paid for with a £1,000 prize for European regional culture, 1992, presented along with a certificate (right, which is behind the framed copy in my house at Auchtertyre) at a special concert in York Minster. N.B. one track had to be Susato's gaillarde Mille Ducats. Recorded by Brewhouse in a school library which had a fine accoustic for the purpose until they removed all the bookshelves and carpets to 'give us room'. We played traditional winter music in the intense heat of july, surrounded by remaining book shelving draped with carpets to reduce the echo. This time our singer was the fine soprano Deborah Catterall, who has been The York Waits' singer ever since. There is simply no better - and she can very competently manage six middle-aged men when on tour (as in the USA in December 1999). First outing for the Cronin shawms on Personent Hodie, our best shawm sound until Proface! Welcome! In my opinion, the best disc we made before I completely retired from the band. The opening track Proface! Welcome! is quintessentially The York Waits' sound at its best, performed on Robert Cronin's fabulous shawms and a Frank Tomes saggbut in A with the big drum a-thundering. Played along High Petergate by the wall of St Michael le Belfrey it is the most exciting experience (accouter'd), just before turning right into Stonegate for a few rousing choruses of Brüder Conrad's Tanzmass, the climax of York's annual procession the Yule Riding (meet on 21 December at Micklegate Bar, 6 pm sharp). The disc opens with the Yool-girthol proclaimed by the authentic Yorkshire voice of one of the waits, John Peel: "Oyez, Oyez! We command that the peace of our lady the queene be well keeped and mayntayned by night and by day, &c." followed by the waits' band of shawms and saggbut. Deborah Catterall too, in finest form! Magnificent. "Variously serene and rumbustious pieces performed with dazzling skill … The whole is an absolute delight …" - The Living Tradition. "This collection is delightful – a good blend of sprightly dance tunes and more serious works, rendered on a wide variety of instruments ... It all makes for a rich and absorbing experience." – Green Man Review, USA. This is The Punk's Delight remastered and reissued by Brewhouse. We were very pleased with the cover picture, snapped on my camera by a surprised passer-by at the grave of Thomas Coward, the last wait in Alnwick, Northumberland. We made this a memorial to York Wait Ian Richardson, 1951-2007. The film was black & white and I added the red. 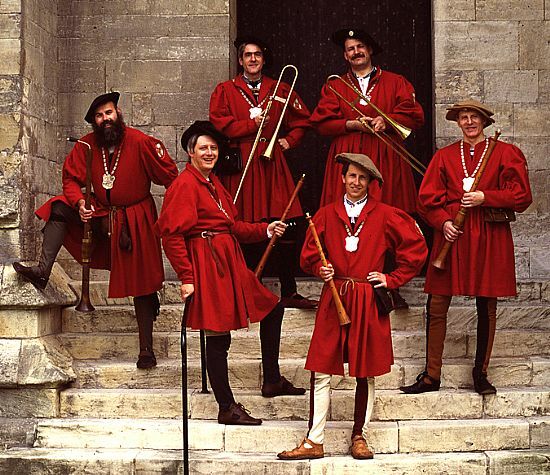 Music from the life and times of Henry VIII. "It takes a very special band to be able to surprise you when they have been playing together for 30 years, and when the material is from one of the most popular and regularly-performed periods of musical history. How can a CD of music from the time of Henry VIII not fall into a series of clichés and repetitions of familiar material? Yet I had high expectations – I was hoping to be surprised, and I was." - Lizzie Gutteridge, The Waits Website. Music from the Gresley Manuscript recorded for Dolmetsch Historical Dance Society. An instruction book for the dances is available from their website. 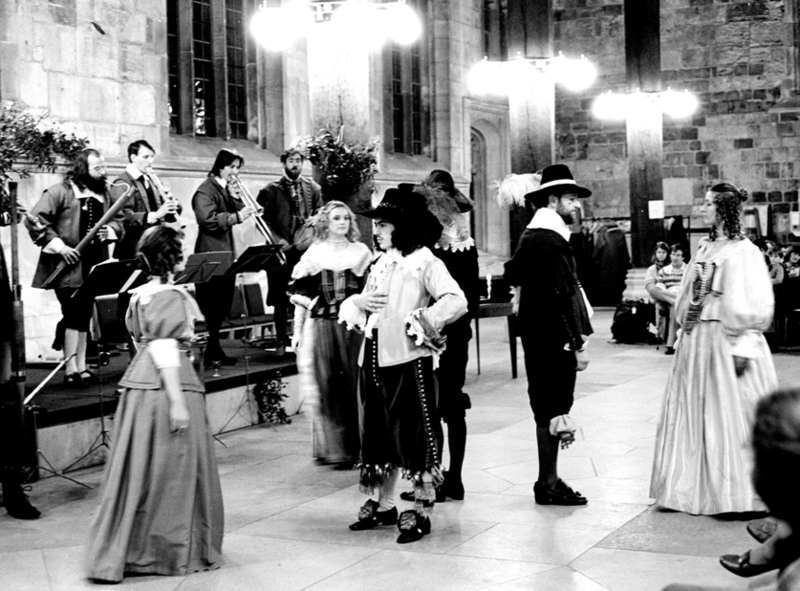 "I suspect those who do enjoy historical dance are going to have a good time with these pieces, and the York Waits have managed to convince me that the music of the Gresley manuscript can be the springboard for some successful musical invention." - Simon Pickard, South West Early Music Forum. "We will unite the white rose and the red,” proclaims the Earl of Richmond – shortly to be crowned Henry VII – at the conclusion of Shakespeare’s Richard III... The 15th century was a great age of song and this recording includes some of the best examples from the period.